Ms. Sanchez joined Gibson Robb & Lindh in 1999. Her practice focuses on property subrogation, maritime, and general civil litigation. She handles property, inland marine, and cargo subrogation. She is also an experienced personal injury defense lawyer. Ms. Sanchez has successfully resolved cases in all aspects of litigation including trial, arbitration, and mediation. In 2014, Ms. Sanchez obtained a defense judgment for the Port of Stockton. Hyundai Merchant Marine Co., Ltd. v. Stockton Port Dist. (ED. Cali.) 2014 WL 2575488. Hyundai sued the Port for damages when its chartered vessel touched bottom at low tide. There was no damage to the ship or its cargo, which was eventually off loaded in San Francisco. The court agreed there were no facts supporting a breach of contract claim against the Port of Stockton and the negligence cause of action was barred by applicable law, and granted the Port’s summary judgment motion. Cargo Subrogation: Avoiding Pitfalls and Putting Liable Parties on the Defensive, Subrogator, Fall 2005 (co-written with Joshua Kirsch). The Legal Implications of an Oil Spill, Bar Association of San Francisco Bulletin, Vol. 3, February 2008 (co-written with Marisa Huber). Ms. Sanchez has been actively involved in the National Association of Subrogation Professional since 1999 when she attended the first national conference in Las Vegas. In 2016, she co-chaired the Litigation Skills Conference which focused on product defect cases. She was a Property Track Section Leader for the national conference in November, 2014, and is a past chair of NASP’s Northern California Chapter. She has been a presenter at a variety of NASP functions including several national conferences. 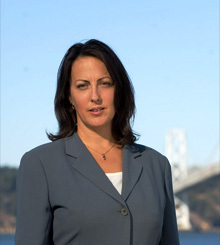 Ms. Sanchez Chaired the Pacific Admiralty Section of the Bar Association of San Francisco which presented the 2008 Pacific Admiralty Seminar, a two-day seminar providing an analysis of recent developments in maritime law. Ms. Sanchez chairs the Local Admiralty Rules Advisory Subcommittee of the United States District Court, Northern District of California. She has served a member of the committee since 2006. Ms. Sanchez is also a frequent presenter with the Practicing Law Institute on negotiation skills- from basic skills to complex negotiations.